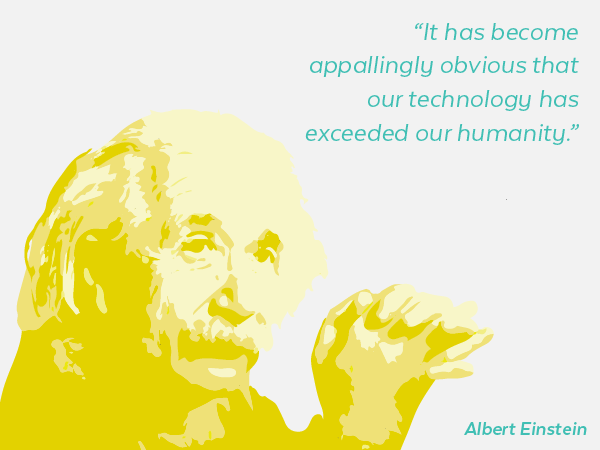 There’s no denying that technology has helped advance the human race, but technology can also amplify the negative aspects of human nature. 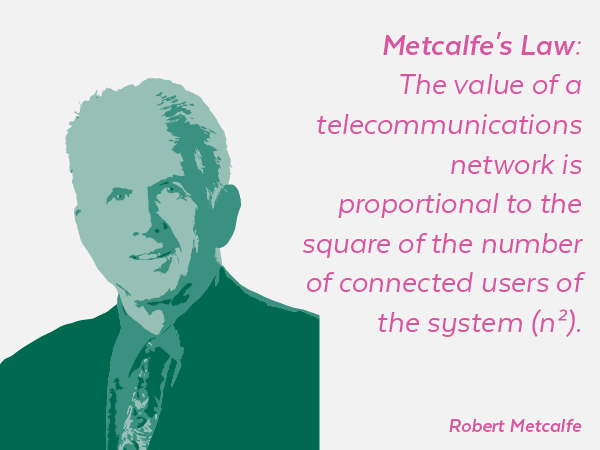 Information Technology, more than any other invention of our time, has had a profound impact on nearly every aspect of our lives. 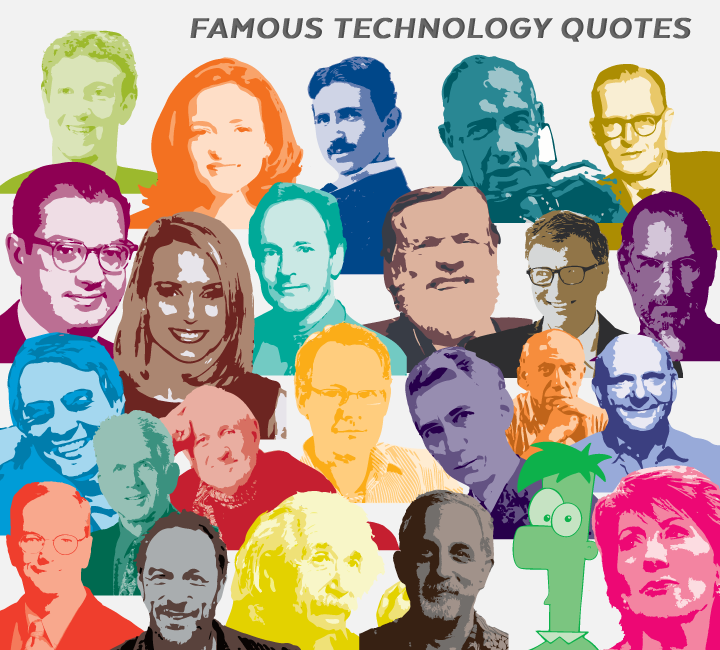 The following tech quotes will reveal why many great historical and contemporary figures harbor mixed feelings towards Information Technology. 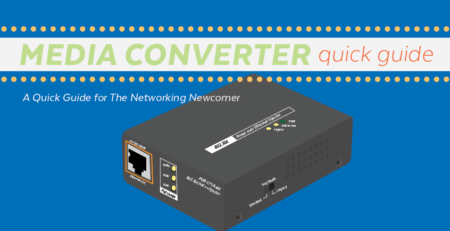 The inventor of the Ethernet proposed that the strength of a computer network is exponentially proportional to the square of the number of users. 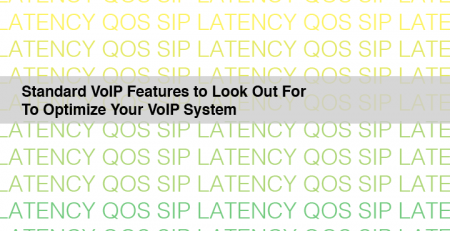 The law originally referred to communicating devices such as fax machines but was later expanded to include computer networks and users. 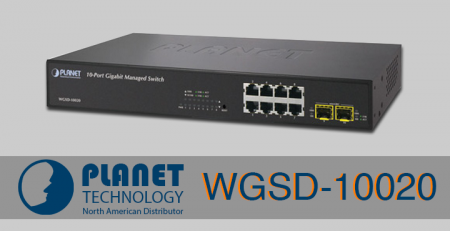 Indeed, the World Wide Web becomes a stronger global network and information hub with each additional new user. According to Statista, the World Wide Web supports approximately 3.17 billion online users. 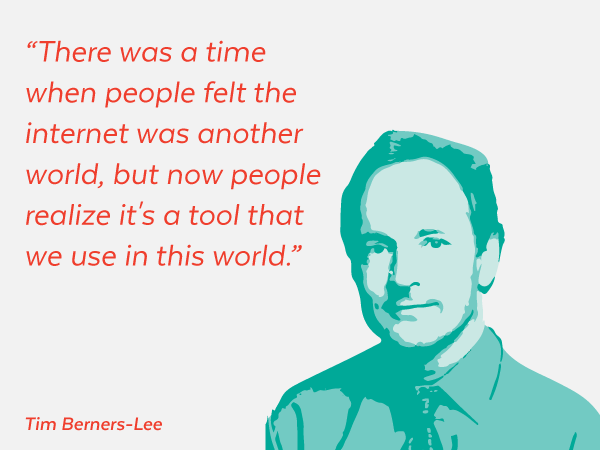 Credited as the inventor of the World Wide Web, Tim Berners-Lee relates how embedding our day to day lives with technology has become second-nature. More than ever, our interaction with the physical world is heavily influenced by digital information and we’ve colonized cyberspace with digital representations of ourselves through social media. 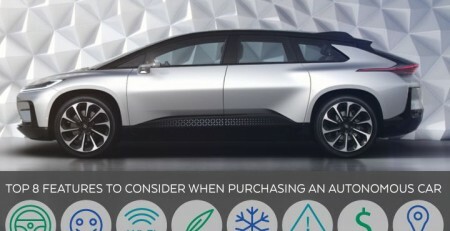 Social media and online communities have led to the formation of virtual tribes where like-minded people can connect. 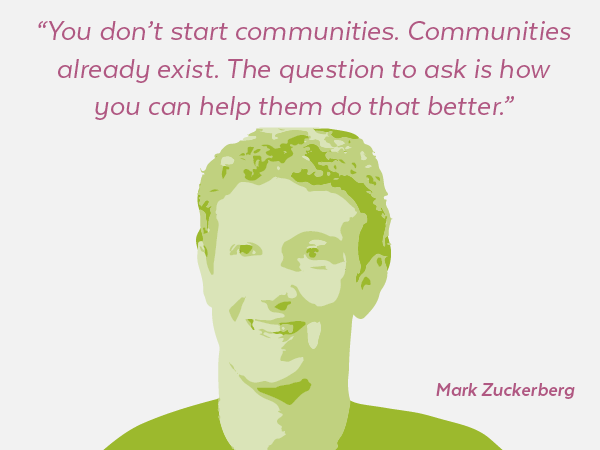 Zuckerberg recognizes that these online social communities are autonomous and that developers can only strive to bring elegant organization to them. 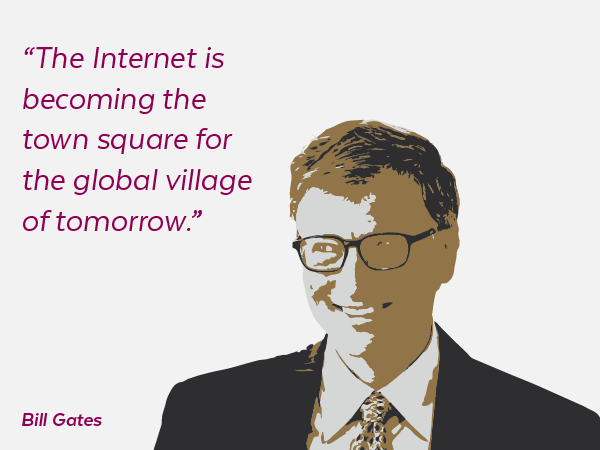 Microsoft’s former CEO, Bill Gates, characterizes the Internet as the epicenter of a world that the Internet is constantly shrinking. 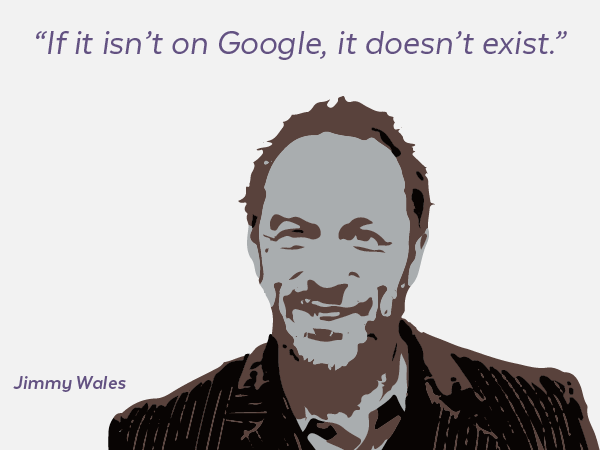 The co-founder of Wikipedia provides an amusing commentary that relates how Google immortalizes information and events and perpetuates the “In Google We Trust” sentiment. 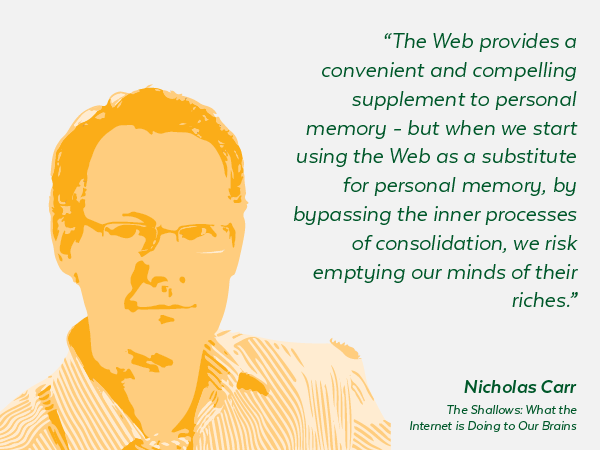 Nicholas Carr dedicates his entire book The Shallows: What the Internet is Doing to Our Brains to explore how our interaction with the internet is changing the way we think. 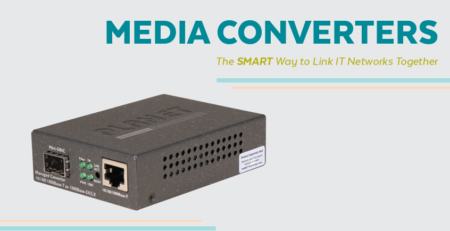 He credits the internet for turning us into “lab rats constantly pressing levers to get tiny pellets of social or intellectual nourishment.” With sites such as Buzzfeed, Huffington Post, and Reddit, it has also become extremely difficult to use the internet as a productive resource. 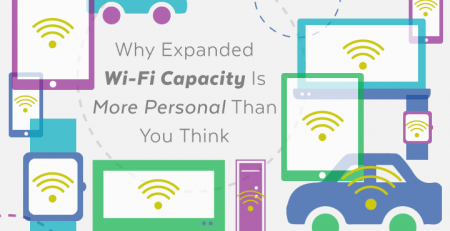 Even more importantly, the internet frees us from the responsibility of having to retain anything in our long-term memory. 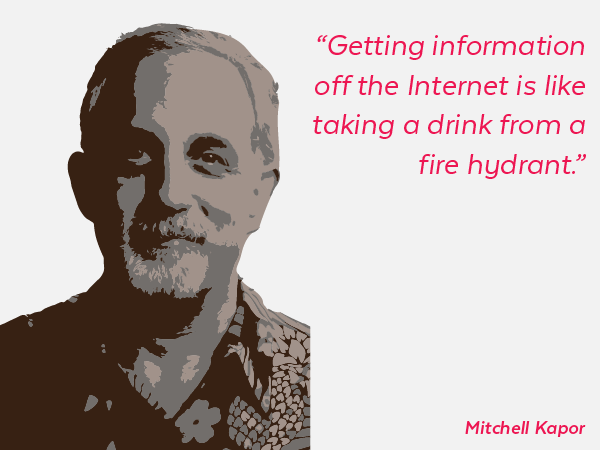 Personal Computing Pioneer and Investor Mitchell Kapor, comments on the abundance of information available on the Internet. Remember the last time you tried researching a single fact? You probably received more information than you bargained for and got sidetracked with clickbait articles. 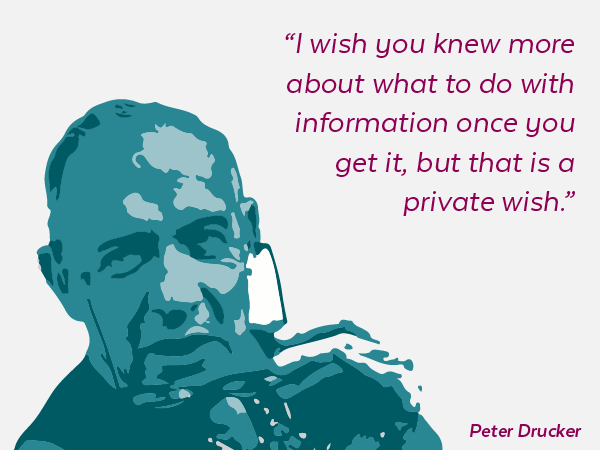 Peter Drucker is best known for his prolific work in management but he also had a grasp of the impact of information technology and big data. After lauding IBM executives for their valuable contribution in a 1955 meeting, Drucker reflected on the futility of information without meaningful interpretation. 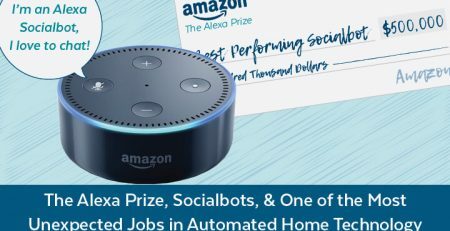 We reportedly upload 5 Exabytes of information every 2 days and this number will increase as IoT continues to be adopted in the industrial and consumer sectors. But according to The Guardian, we only analyze 0.5% of the data that we create and we are led to question the intrinsic value of the information that we are generating. 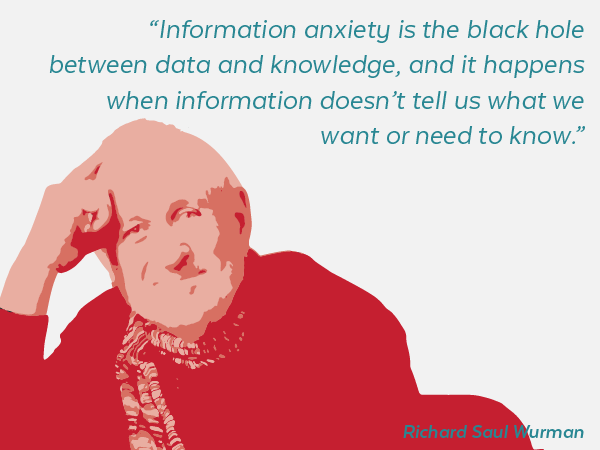 Best known for creating the Ted conferences, Richard Saul Wurman acknowledges the limitations of information and identifies the hazy gap between information and knowledge as the root of information anxiety. Future studies author John Naisbitt, echoes a similar sentiment related to information anxiety. Knowledge, according to David Weignberger, occurs when data or information can be organized into action plans. The DIKW (Data-Information-Knowledge-Wisdom) pyramid hierarchizes the different types of information. 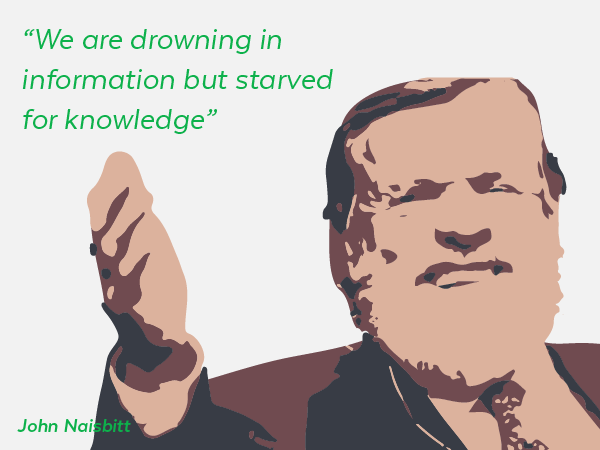 Without the kinetic transformation of information and data into knowledge via meaningful interpretation, we risk starving for knowledge (and wisdom) as posited by Naisbitt. 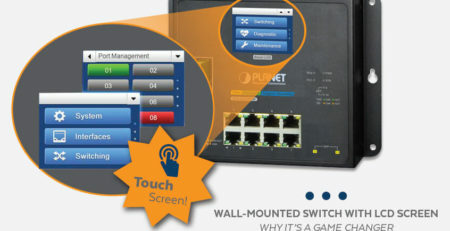 We use technology without understanding how it operates. 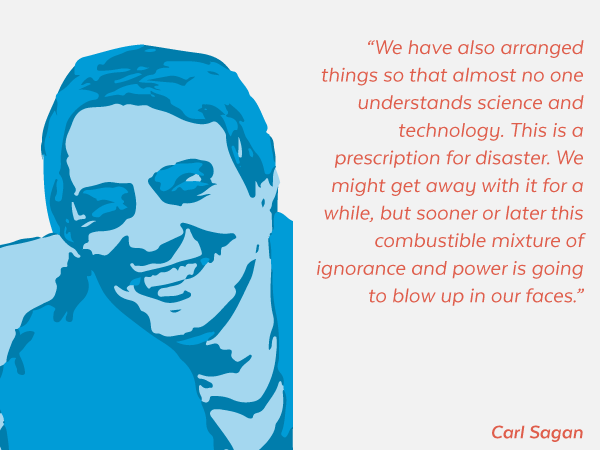 Astronomer Carl Sagen pointed out the dangers of our limitation of knowledge when it comes to technology. Our ignorance of the innards of our smartphones for example, exposes us to possible security threats or privacy breaches from app developers, mobile companies, and hackers. 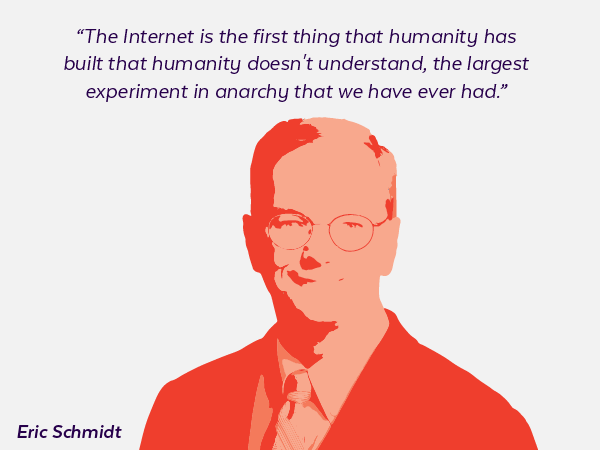 Former CEO of Google, Eric Schmidt, highlights the unknown effects of the internet and compares the technology to anarchy. The internet is indeed the largest social experiment of our time. 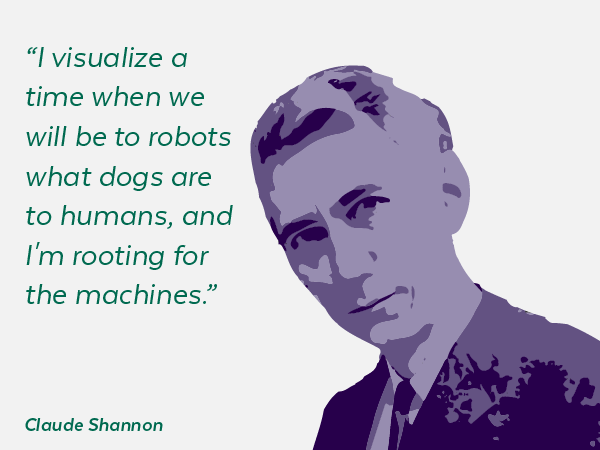 Claude Shannon, “father of information theory”, envisioned that robots would enslave humans Terminator-style. This quote has been attributed to Einstein even though some argue that the apocryphal quote came from the movie Powder. Nevertheless, Einstein was known to distrust those in those in power to responsibly manage the invention of the atom bomb. 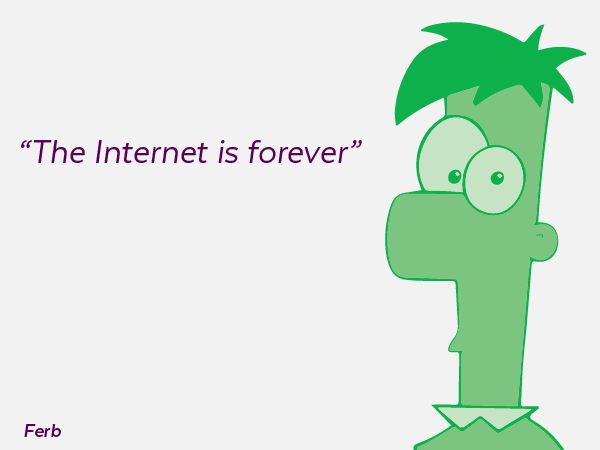 The popular cartoon character hauntingly captures the immortal permanence of the content that we upload on the Internet. Facebook’s COO believes social media can be a powerful tool for people without a political voice. The power of a hashtag can even be seen by children’s use of the viral #thanksmichelleobama hashtag to protest their unappetizing school lunches. 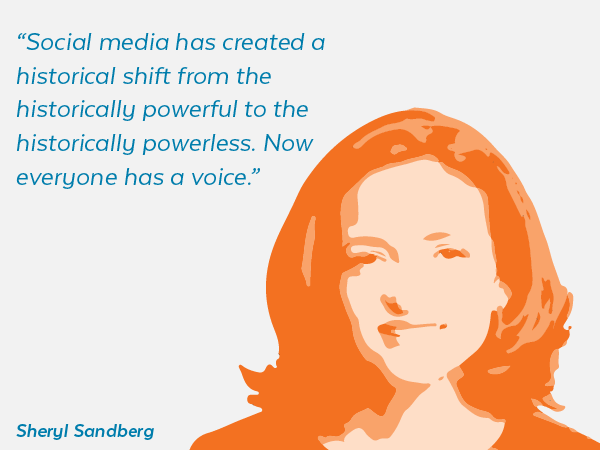 On a more serious and recent note however, Sheryl Sandberg shed light on how social media can be used against Islamic extremists. 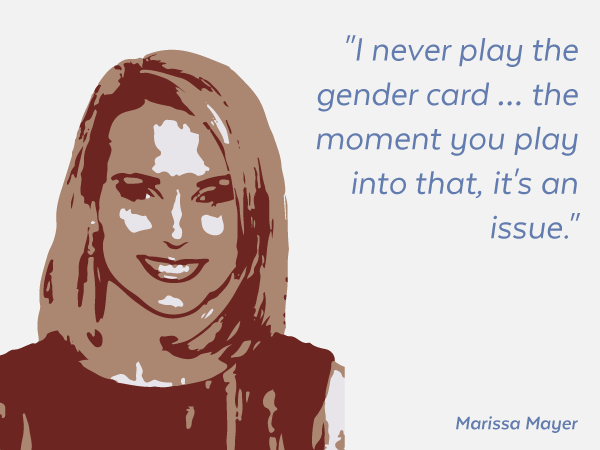 The tech sector, unfortunately, is still a highly gendered industry despite what Marissa Mayer, CEO of Facebook, has been noted to state. Male-to-Female employment statistics repeatedly prove that the tech industry is a male-dominated sector. Her statement made many of her supporters cringe. 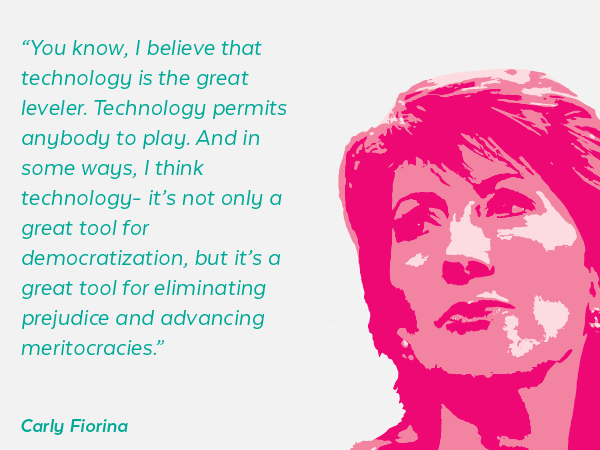 Former Hewlett Packard CEO and former presidential candidate, Carly Fiorina, relates how technology can be used as an ethical tool that can level the playing field for communities that have been oppressed. 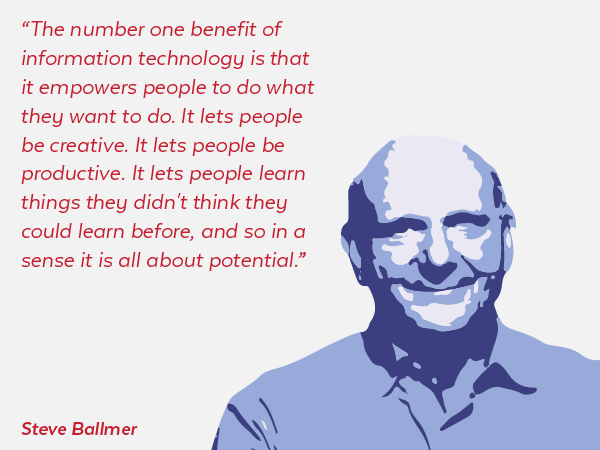 Former CEO of Microsoft highlights the creative possibilities that the Internet offers to people that have access to it. 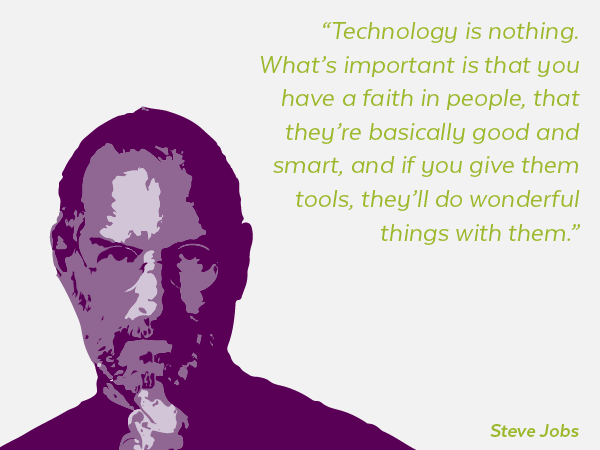 Steve Jobs expressed his faith that technology could be a tool for advancement and productivity in the right hands. If you’re worried that machines will take over, you can take consolation in Picasso’s belief that computers are not capable of creative expression. 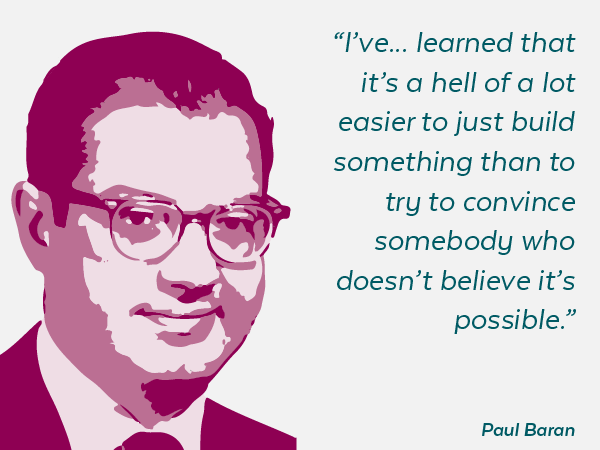 Paul Baran’s line of thinking captures the importance of grit in this brave new world of the Information Age. 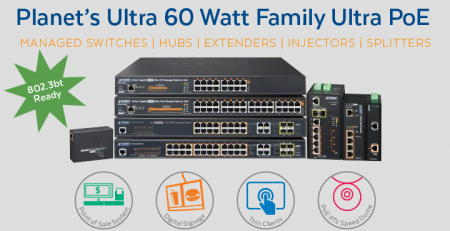 Paul Baran is credited with having provided the foundation for packet switched networks. 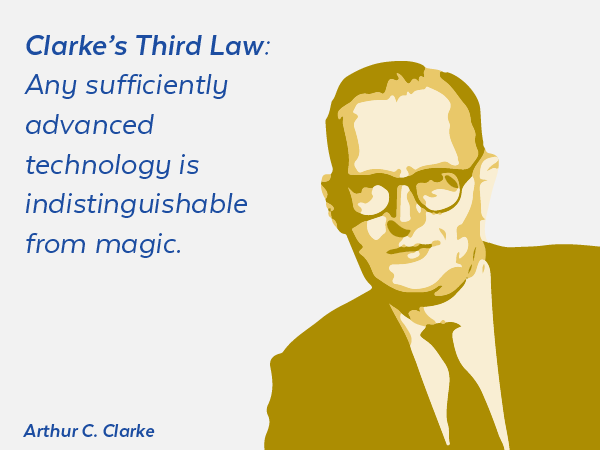 Arthur C. Clarke shares his view that is felt around the fanaticism that occurs every year at CES- technology can be breathtakingly magical. 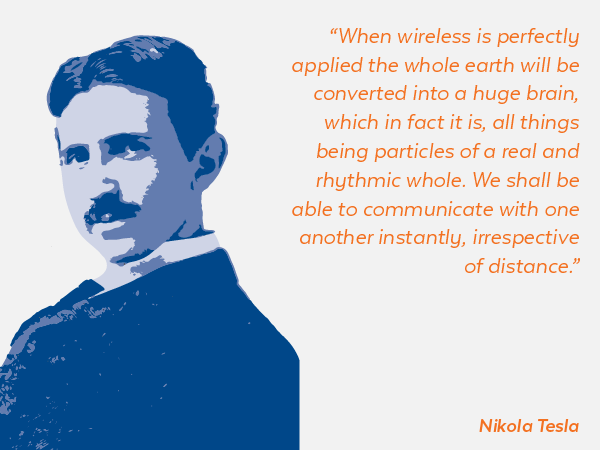 Share this post if you find information technology fascinating! Nice Quotes. 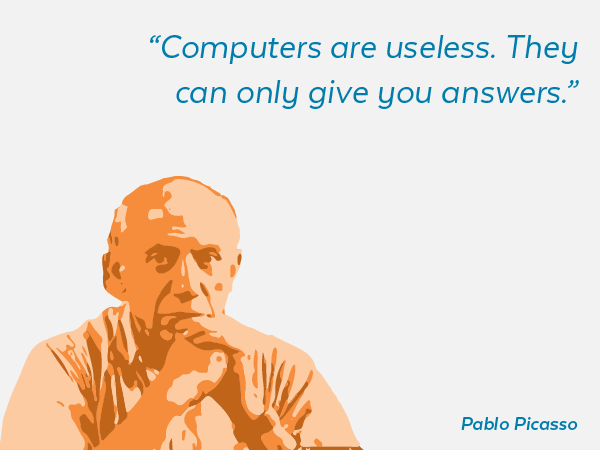 This is my favorite quote from Pablo Picasso “Computer are useless, they give you only answers”. 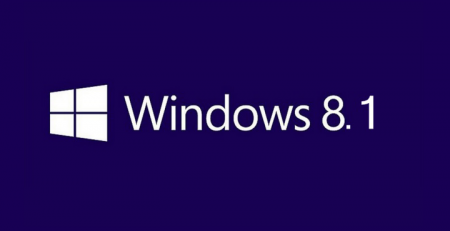 Updated technology make a perfection for continuing surviving the global World. What about ‘Nothing’ or Nothingness?